The Walking Dead: Who Are The Hunters? 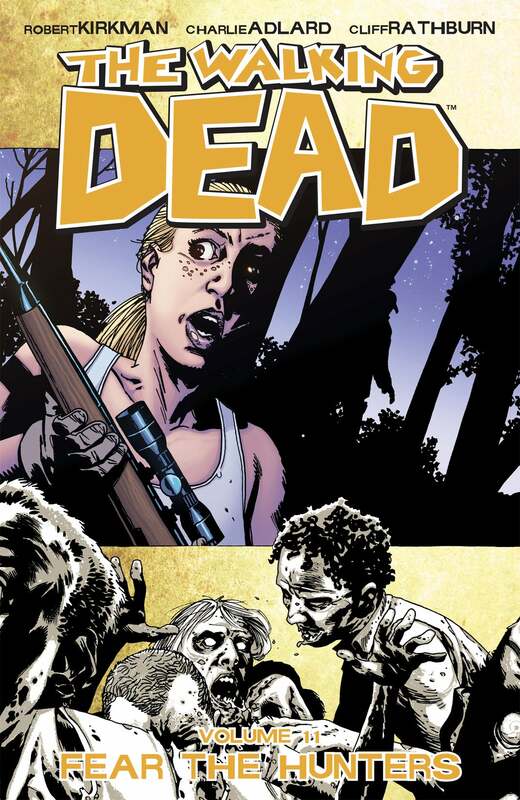 With the events of AMC's The Walking Dead Season Four having evolved to the point where events from Skybound's The Walking Dead #49-60 from the comics have popped up onscreen, many fans assume it's only a matter of time before television viewers become acquainted with The Hunters. The group, a roving band of cannibals, were headquartered out of an isolated, rural house in the comics. They would stalk, trap and kill other survivors for their meat, eating them slowly and putting tourniquets on their wounds so that their victims would last longer in a world without refrigeration. Keeping their victims alive as long as possible also had the added benefit of preventing them from reanimating before the meat was off the bone. 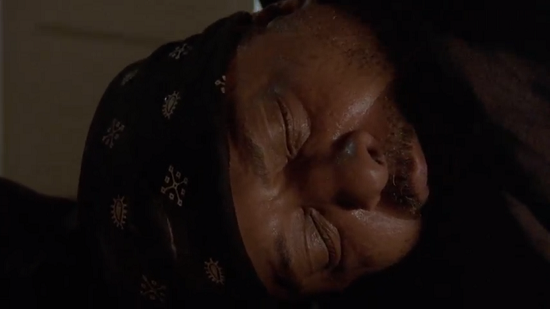 And, yes, not only did they take one of the principal cast, but that character got one of the most memorable deaths in The Walking Dead history out of it. That was Dale Horvath, though, and on the TV show, he's been gone for quite a while. When he died, I vaguely remember producers saying that they had another character in mind who could "take" his death to make it work, but it would be difficult to speculate who that would be, if indeed it happens. That said, we do have a whole batch of survivors who were either dead at this point in the comics, or didn't exist at all. Carol, Tyreese, Daryl, Lizzie, Mika and Beth could all die and not impact future storylines at all, assuming (which of course you can't really do) that the show plans to follow the comics faithfully. Again, the comics aren't necessarily a foolproof indicator of future storylines, and some of those characters are not likely to die anytime soon. Nevertheless, having all of those people collected into a pair of groups traveling together seemingly makes one or more of them vulnerable. There had, in fact, been some speculation that we'd already met The Hunters, after Rick's experience in "Claimed" brought him (literally) face to face with a group of violent, unpleasant men who found their way into the house where he was napping and could have killed him had he not been cleverer than we've seen Rick be in quite some time. A new interview with Robert Kirkman, though, suggests that may not be the case...although we haven't seen the last of those guys. Over at Screen Crush, they refer to the group as "home invaders," and while it's their words, not Kirkman's, it got us to thinking: this season has also incorporated a number of elements from Kirkman and Jay Bonansinga's series of The Walking Dead prose novels based on The Governor. 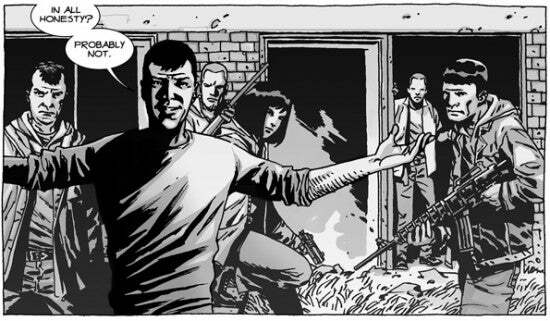 There was a group referred to only as "home invaders" in The Walking Dead: Rise of the Governor, too, and that might be notable because, at least in "Claimed," those guys didn't seem bright enough to pull off the kinds of stuff The Hunters did in the comics. Since that's all speculation, try this on for side: The credits on "Claimed" named three of the characters, and they did not sync up with the names of any of The Hunters from the comics. The Hunters were Chris, Theresa, Albert, David, Greg and Charlie. This new group of home invaders were credited as Joe, Len and Tony. Obviously, there's an element of playing your cards close to the vest that has to happen with a show like The Walking Dead, but so far they've done that by waiting to introduce new characters until they were ready to tell that story. Changing names to keep the characters' comic book plot anonymous would not only be unprecedented, but it would fly in the face of the frequently-repeated mantra that the comics aren't a reliable guide as to everything that will happen with a character (Bob Stookey, for instance, was an ally of The Governor and didn't last long. His alcoholism, only hinted at a few times, was the single really defining trait his character had in the comics). All that said, those guys will be back at some point. "I think it would be very strange if we didn’t [see those characters again] since [Jeff Kober]’s such a recognizable actor," Kirkman is quoted as saying. "It was kind of by design. I’m actually really proud about how it all ended up. It’s almost hard to spot him the way things are edited and the way the episode goes. His character is definitely going to be returning again and it will happen when you least expect it." ...and where are The Hunters?